My overall goal is to provide patients personalized treatment plans while managing their symptoms to enhance quality of life. Dr. Natalie Godbee joined Cancer Treatment Centers of America® (CTCA) in August 2017 as a Gynecologic Oncologist and will serve gynecologic cancer patients at our Phoenix hospital. When working with patients, she believes in taking into consideration all systems of the body to provide whole-person care. "I work with a team of doctors and clinicians to offer a comforting approach to developing and managing each patient’s treatment plan," says Dr. Godbee. "I take the time to talk with all of my patients and answer and any questions they may have." Dr. Godbee graduated from Howard University in Washington D.C., where she received a Bachelor of Science in mathematics. Dr. Godbee earned her Doctor of Medicine from Philadelphia College of Osteopathic Medicine-Georgia Campus in Suwanee, Georgia. She was then Chief Resident and completed an obstetrics and gynecology residency at Henry Ford Macomb Hospital in Clinton Township, Michigan. Dr. Godbee went on to complete a fellowship in gynecologic oncology at Wellspan York Hospital in York, Pennsylvania. Dr. Godbee is a member of several organizations, including the American Osteopathic Association, American College of Osteopathic Obstetricians and Gynecologists, American Congress of Obstetricians and Gynecologists and Society of Gynecologic Oncology. 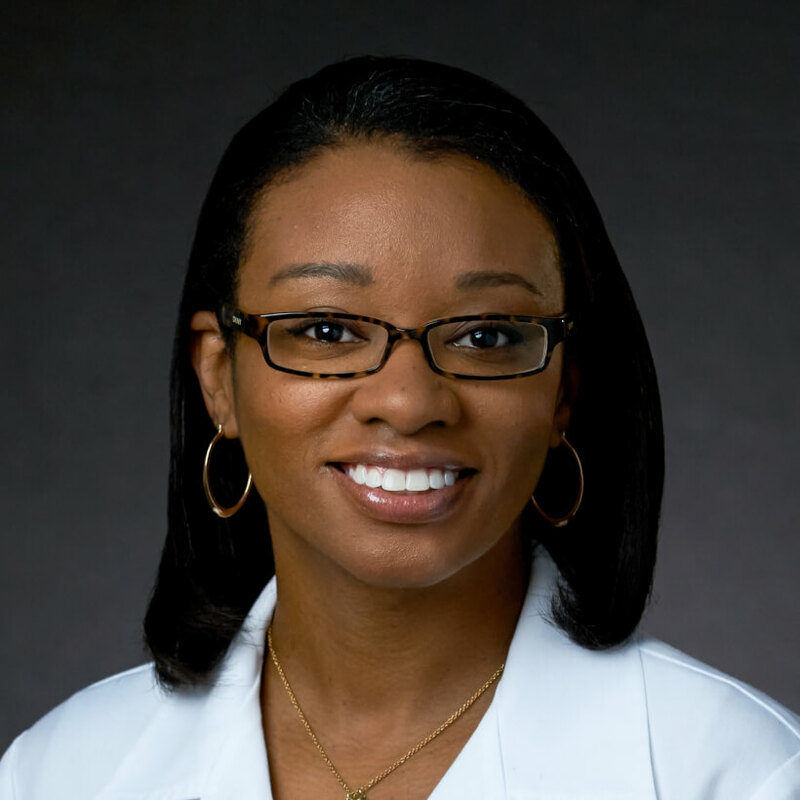 Outside of practicing medicine, Dr. Godbee enjoys spending time with her family and friends. She also likes to cook and try out new recipes. "Love that they spent more than 10 mins. explaining the types of cancers I had and what to expect!" "[...] I feel like she is still young and not as experienced. But very nice." "I feel confident that Dr. Godbee has the knowledge and expertise in treating me as a patient. She was very well acquainted with my case, and her attention to detail will make sure that my treatments will be successful." "*Dr. Godbee & her staff are very responsive & caring. I am blessed to have them." "Dr.Godbee is very good at what she does"
"I love and have total confidence in my doctor. She is the reason I travel across the state for treatment." "My medical oncologist is awesome. Love her spirit and the help she's giving me." "We really love and treat *Natalie Godbee! We feel safe with her and believe she is truly vested in helping me get better! She is SO smart, very educated!" "love Dr Godbee and her care. she balances the treatment while assessing my body's tolerance. She had never made my family or I feel rushed. The whole team is awesome!" "Dr. Godbee is amazing. She is so kind and considerate. She answers all of my questions. I will always be thankful to her and her staff.[...]" "Dr Godbee and all of the consulting Doctors I have seen, are outstanding and have given me excellent care! I have every confidence in them. I am also grateful that they have willingly keep my PCP in the loop, per me request. Also, Dr Godbee and her Nurse have worked with my Employer HR providing information and letters for my Medical time off helping to protect my job, much appreciated!!" "Dr Godbee is superb. Couldn't ask for better." "*Dr. Natalie Godbee DO is phenomenal. She's truly an awesome & loving caring doctor. I'm truly bless to be here at The Cancer Treatment Center of America." "Dr . Godbee is extremely professional and at the same time very caring." "Dr. Godbee is the best"
"Oncologist and staff are quite supporting and work with getting me the best care and referrals." "*Dr. Godbee needs to listen to the patient not have preconceived ideas. Her "bedside manner" has room to grow; it certain does not meet the "mother standard."" "my doctor is awesome. She explains things very well and thoroughly. She is so nice and caring. She is very informative and is a good listener." "*Dr. Godbee is great awesome doctor. I love her."